Description: CSXT Northbound Freight Train at Flint City, Al. Description: Still in full CR Quality paint, 7374 pulls from Taft Ramp with Q258. 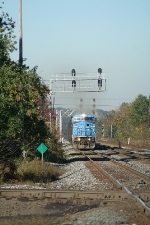 Description: A CSX northbound autorack train passes the site of new road construction. Description: CSX C40-8W #7374, still in Conrail blue brings a train into Hamlet.